Sitting here waiting for a near-endless upload to finish uploading, so let us have a Random Mine. I went past this mine this morning. 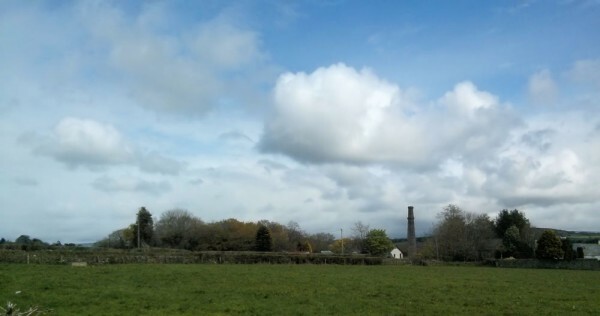 You may have to click to embiggen to see that there are actually two chimneys there - the naked one on the right is clear, but I am fairly sure that the thing on the left that looks like a tall dark tree is also in fact a chimney, thoroughly shrouded in ivy. There's an engine house in there somewhere among the trees as well, although I couldn't see it so it may well be impersonating an ivy-covered bush. This is not the famous Cornish Wheal Edward mine, posing spectacularly on a rocky cliff above the sea near St Just. This is the little Tamar Valley Wheal Edward near Calstock, and the distant hills you can just see in the background are across the Tamar River in Devon. Wheal Edward dates from about 1830 and ran, on and off in the strangely indecisive manner of these small Cornish mines, until 1877, or thereabouts. Copper, tin, pyrite, arsenic and wolfram were all mined here, although not with huge success. By 1861, the mine had a 36'' pumping engine and a 22'' engine for drawing and crushing, but then the tin crash came and there was nothing for it but to close up shop and become a little farm. .... and my upload is done at last! hurray. What a nice romantic and evocative photo! Knowing next to nothing about geology (at my high school you either had Latin or earth science -- never both), I had no idea pyrite was considered useful. Fool's gold -- that's all I'd heard of.